If you’ve always dreamed about living in a space where the light comes in and everything is bright and beautiful, this Ojai home by REATH, was made for you. It balances wood and metal with unique fixtures with lively colors that area anything but too much. This home truly illustrates how you can use color in the home and do it right. Take for instance this beautiful kitchen. An island with a smooth wooden top and blue boards at the base matches blue cabinets and marble countertops paired with leather chairs. 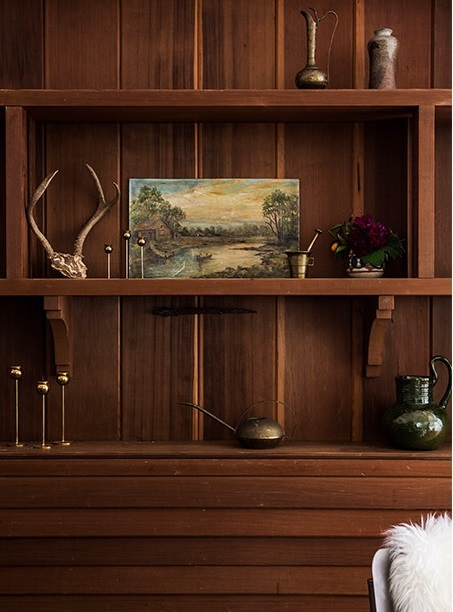 A wood table in the adjacent breakfast nook also fills up the space while offering another space to eat. Colorful throw pillows add a little more pattern and a pop of color that doesn’t dominate the room. All of this color is balanced by a plethora of white painted walls which create a feeling of clean calm and balance all of the textures and color in the room. A silver oven and stove with a hood and hanging pots and pans over the island make this the ideal place to cook a meal or whip up a fresh pitcher of mint lemonade. 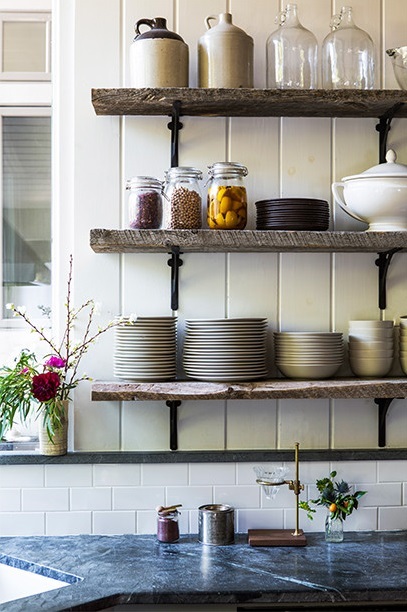 The glass windows let in lots of natural sunlight and keep the room open, and grainy wooden shelves provide plenty of room to store your kitchen supplies. 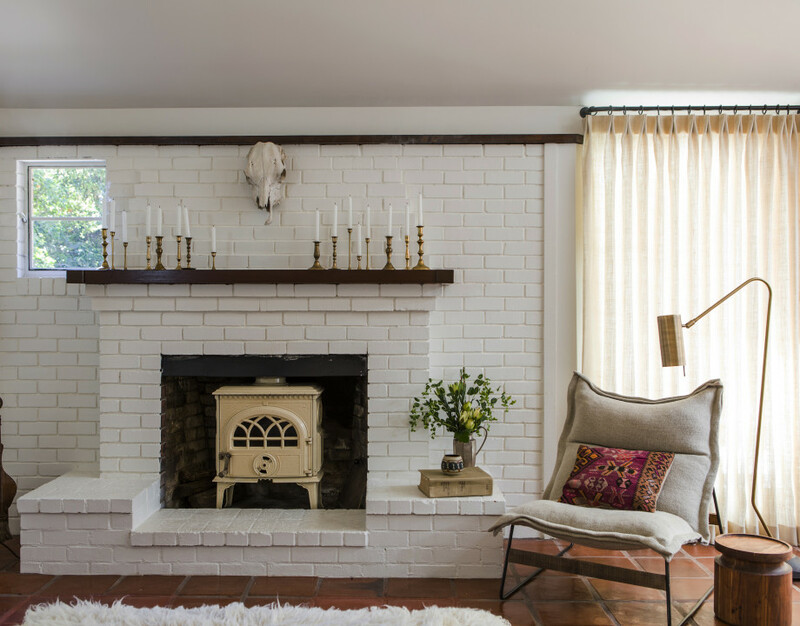 The living room has less color than the other spaces, with white bricks making up a wall with a fireplace and a wooden mantle. Peach curtains allow you to control how much light comes into the room, while a taupe chair with a colorful throw pillow provide seating. Candles on top of the mantle and a skull provide a unique baroque, Tex-Mex touch. The other part of the living area is arguably the best part. This is interior design heaven. 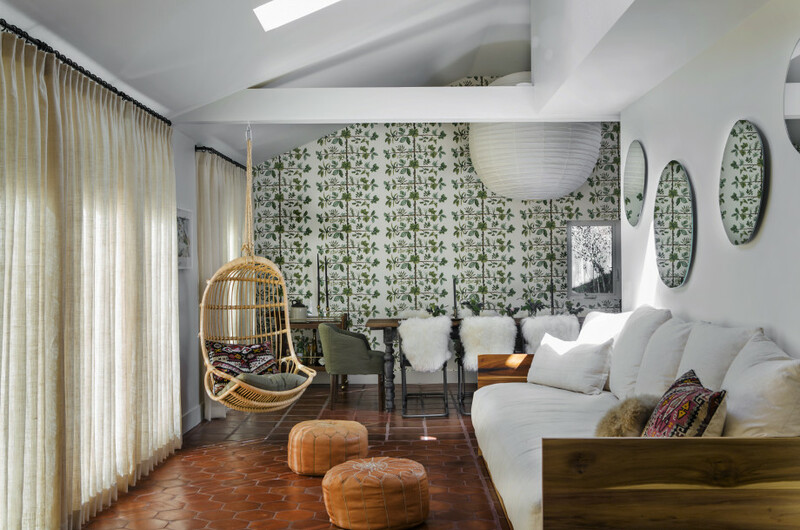 A hanging wicker chair adds bohemian feel (not to mention looks cool) and is cushioned with two colorful pillows. A white sofa with wooden accents stabilizes the room and allows the plant-inspired wallpaper in the other room to keep from overwhelming with too much pattern, as do the all-white furry chairs. Add some mirrors above the sofa and some leather footstools with some shiny warm brown honeycomb tile, and you’ve got the perfect mix of California cool and comfortable. 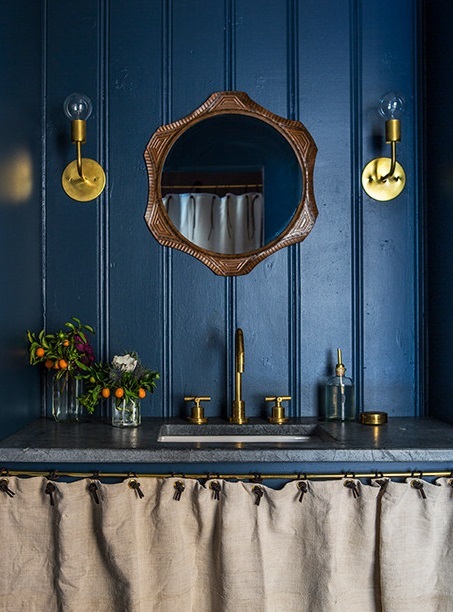 Pigmented blue painted boards in the bathroom create a pulled together feeling, and bronze and gold accents combine to create calm and effortless style. Compare that to the almost Midwestern feel of polished and stained wooden cabinets and you’ve got plenty of room to decorate. The bedroom is arguably the best part of this gorgeous home. Airy, bright and beautiful, the enormous windows require a color scheme that is just as naturally beautiful. Cue white walls, a white and taupe bed with cloth-covered headboard, wooden side tables and beige curtains. You’ll want to wake up everyday in a bedroom just like this one. Channel your inner zen with an all-white Asian-inspired bathroom! 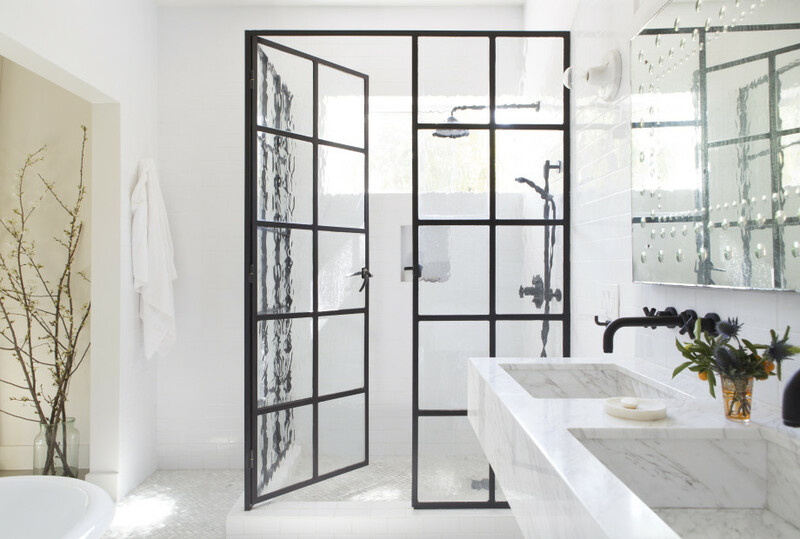 A walk-in steam shower with transparent doors and a large mirror with matching marble basins make this bathroom a work of art. Accent with branches in a glass jar and flowers by the sink to keep the room from being overwhelmed by the monochromatic design. 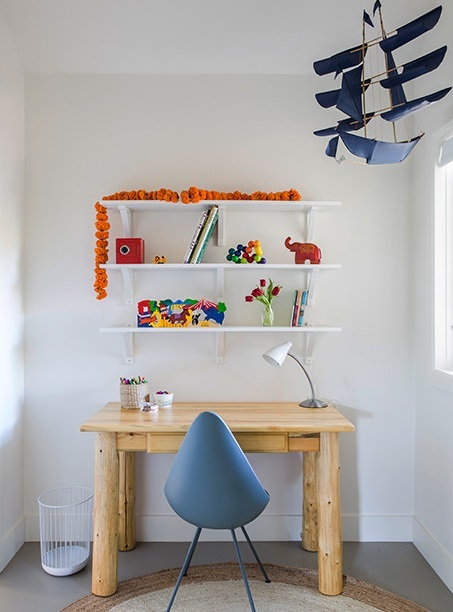 Last but not least, create a cute kid’s room by adding tons of color to a room mostly in white. 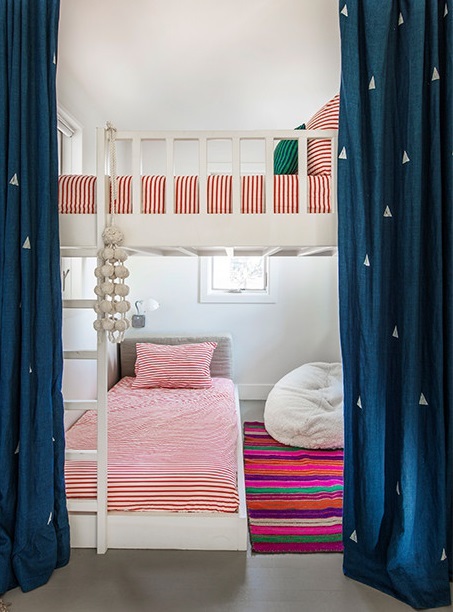 Here you can get a bit playful and add some colors that are more kid-friendly than chic but still look cool. 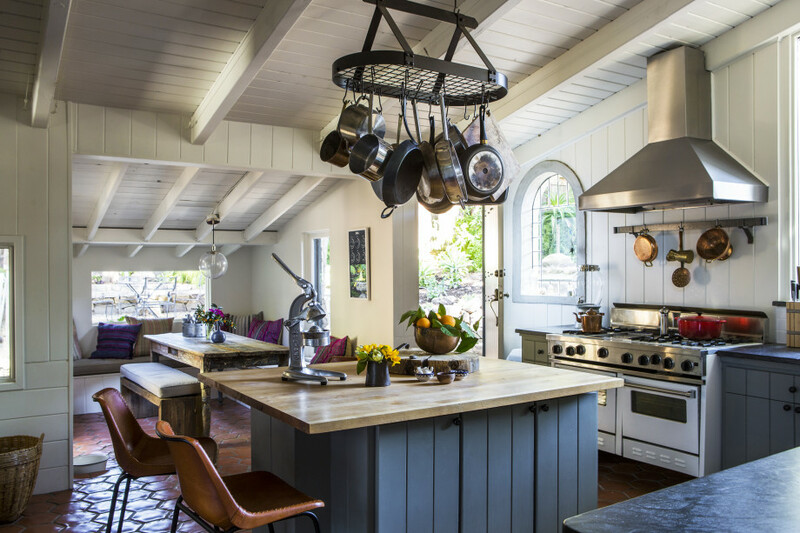 What did you think about this gorgeous California home? Did anything inspire you? Let us know in the comments what you thought about this airy and bright interior design!